Applies to all employers and workers and regulates leave, working hours, employment contracts, deductions, pay slips, and termination. COMPENSATION FOR OCCUPATIONAL INJURIES AND DISEASE ACT. UNEMPLOYMENT INSURANCE FUND (UIF). UNEMPLOYMENT INSURANCE CONTRIBUTIONS ACT . 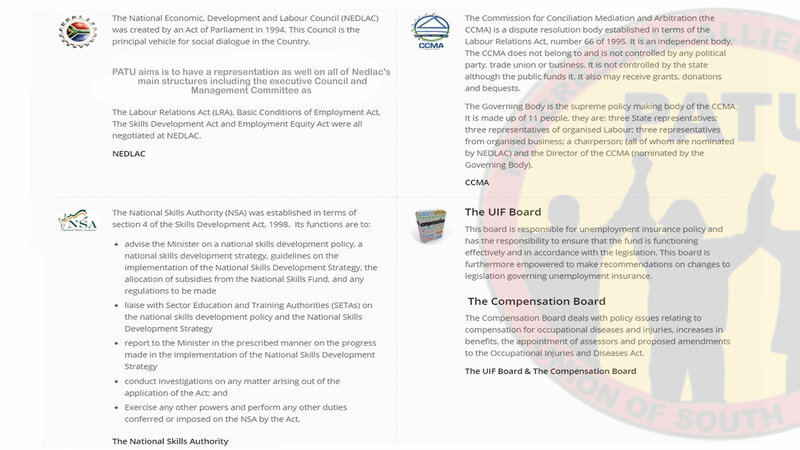 To provide for the promotion and regulation of the training of manpower and for that purpose to provide for the establishment of a National Training Board, a Manpower Development Fund and a Fund for the Training of Unemployed Persons; to provide for the establishment, accreditation, functions and powers of training boards; the registration of regional training centres, private training centres and industry training centres; and the imposition on certain employers of a levy in aid of training; and to provide for matters connected therewith. .